Powered by a single 18650 battery (Not Included), the Geek Vape Athena Squonk Kit is a mechanical bottom feeder device that makes the most of its super stylish post-industrial appearance. The compact, lightweight Athena has a simple exterior, featuring an intuitive locking-switch that’s located just underneath a large thumbprint-sized firing button. This lock switch helps prevent accidental firing when you’re feeding your tank, adjusting its settings, or walking around with it in your pocket. The Aluminum and superior Stainless Steel frame has dimensions of 73mm x 46mm x 35mm and displays a large opening for the Food Grade Silicone squonk bottle. This squonk bottle is capable of storing a massive 6.5mL of e-juice, giving all vapers an unparalleled e-liquid capacity for nonstop vaping. The RDA features a pre-installed 810 drip tip with a 7mm height and 18mm width. For those who prefer 510 drip tips, Geek Vape included a 510 drip tip and its very own 510 drip tip adapter. This postless build deck setup features a surprisingly deep juice well that’s capable of storing larger-than-life coil builds with massive cotton wicks to ensure that your wicks are always saturated and ready to go. 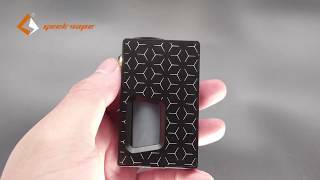 Geek Vape utilized a top angled airflow system (TAAS) with this RDA that successfully prevents any leakage that might happen through the airflow holes if you’ve squonked a little too much e-juice into the juice well. Not only does this unique airflow system prevent leakage, but it also lends to massive clouds that deliver exceptional flavor with each and every vape. If you would like to try the Athena Squonk Mod with other RDA’s, the mod has an auto-adjusting Gold-Plated 510 pin that supports a wide variety of off-brand atomizers. Constructed of high-quality material, the powerful and portable Geek Vape Athena Squonk Kit is the perfect all-in-one setup for any experienced vaper that’s looking to try their hand at squonking for the very first time.